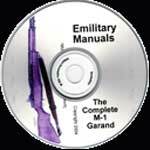 This download has 8 repair and maintenance manuals for the M1 Garand rifle also known as the Rifle Caliber .30, M1. It is a semi-automatic rifle that is chambered for the 30-06 caliber Springfield rifle cartridge. It replaced the M1903 Springfield in 1936.